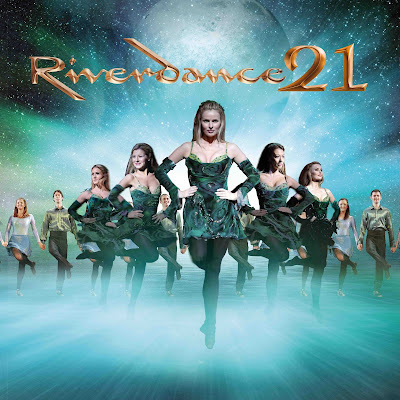 Tuesday 26th April 2016: It might be the 21st anniversary tour of Riverdance, but I have to confess that I’d never seen it until last night since the original, created for the Eurovision Song Contest in 1994 as the ‘interval entertainment’. Composed by Bill Whelan and originally featuring Michael Flatley it has since been seen by more than 25 million people around the world and spawned many rival productions. Frustratingly I wasn’t given a cast list so my apologies if I wrongly credit any performers. With a cast of over 20 including guest artists from Spain and Russia plus 4 incredibly talented musicians and a singer the show, understandably, is argued to be the original and best. As the lead dancers Bobby Hodges and Natasia Petracic were outstanding, featured throughout in both solos, duets and with the incredibly talented and disciplined 18 strong company who were a joy to watch in their precision and fast-moving formations. A balletic yet contemporary pas de deux showed, in particular, the couple’s versatility as dancers. Bobby Hodges stood out, not just because of his incredibly long legs that emphasised the lines of the Irish dance beautifully, but also had a charisma and charm that really came to the fore in the interaction between him and the tap dancers Dharmesh Patel and Rohan Pinnock-Hamilton. It was good to see real humour in the dance-off section- one of the highlights of the evening. The Irish dance was interspersed with performances of superlative Flamenco by Rocio Montoya, Russian folk dance and Tap, which was then fused together which was highly effective in showing the common threads between such diverse cultures. Special mention must also be made of the four superb musicians, Emma McPhilemy (MD/ sax), Ceilidh Briscoe (fiddle), Negah Santos (percussion) and Tara Howley (tin whistle/ Uilleann Pipes) and singer, who were all featured in their own right, blending perfectly with the orchestral synth backing tracks. The standing ovation at the end of the first night audience in Wimbledon said it all- a real delight and as fresh now as when it was first created. Happy 21st!